This chat was less like a traditional interview and more like a conversation between the Beatles themselves. Topics of discussion between the four members include their success, money, their early company 'Beatles Limited,' musicianship and practice. The interview would air one month later on November 3rd. At the time this discussion was recorded, the Beatles were just ten days away from their appearance on 'Saturday Night At The London Palladium,' an important step in their early success in Britain. The group was in the process of recording tracks for their upcoming LP 'With The Beatles' which would be released in the UK on November 22nd. PAUL: "It wasn't so much that we forsaw a big success. We just never thought that anything particularly bad would happen to us. We never felt... never sat down at one particular point at all and, sort of, worried about anything. We've always thought that something would turn up sometime." GEORGE: "We have been misquoted -- people saying we make 7,000 a week, and all that." PAUL: "I wish we did." GEORGE: "We probably do make quite a bit but we don't actually see it, because record royalties, things like that, take months before they come in. And anyway..."
JOHN: "Hotel cost a fortune." GEORGE: "Yeah, my mother cost a fortune." GEORGE: "But we've also got an accountant and a company, Beatles Limited. They see the money. The thing is, indirectly, we are and we aren't doing it for the money, really, because don't forget -- We played for about three or four years or maybe longer just earning hardly anything. Well, we wouldn't have lived on that. If we were doing it for the money, we wouldn't have lasted out all those years. But the money does help, let's face it. Yeah, we all love being on-stage and..."
JOHN: "I haven't got the patience to practice to become a 'perfect' guitarist, you know. I'm more interested in the combination of my voice and the guitar I know, and to write songs, than I am in the instrument. So I never go through a day hardly without playing it whether I'm performing or not, you know." PAUL: "George is the one of us who is interested in the instrument. GEORGE: "Well, I don't PRACTICE." PAUL: "But the other three of us are more interested in the sound of the group." GEORGE: "To be a guitarist, you're supposed to practice a couple of hours a day. But, I mean, I don't do that." 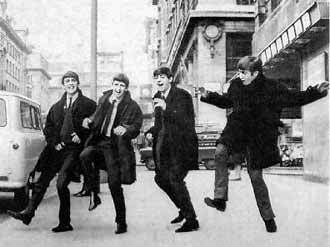 RINGO: "To be ANYTHING, you're supposed to practice a couple of hours a day." GEORGE: "Well you know, I mean, the thing is... Individually we're all... (pause) I suppose we're all crummy musicians, really."